IFAD Project launch "Climate risk management in agriculture with demonstration dite in Indonesia, Lao PDR, and Bangladesh"
Emerging challenges associated with climate variability and change are putting already vulnerable agriculture communities at further risk, with poor rural farmers bearing the brunt of livelihood losses experienced through a failed or delayed monsoon. Although farmers often know a great deal about the risks they face and how to manage them, the rate of change seems to be eclipsing traditional knowledge about the climate and how to deal with climate risks. To help address these challenges, IFAD has financed the project “Climate risk management in agriculture with demonstration sites in Indonesia, Lao PDR, and Bangladesh”. 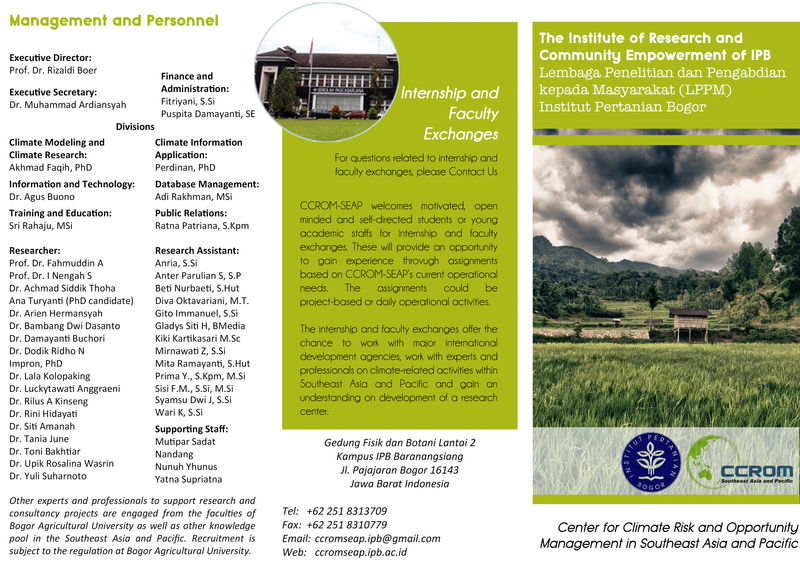 Through this project, the International Research Institute for Climate and Society at Columbia University will collaborate with its regional partners at the Centre for Climate Risk and Opportunity Management in South East Asia and Pacific in Indonesia, the National Agriculture and Forestry Research Institute in the Lao PDR, and WorldFish in Bangladesh. 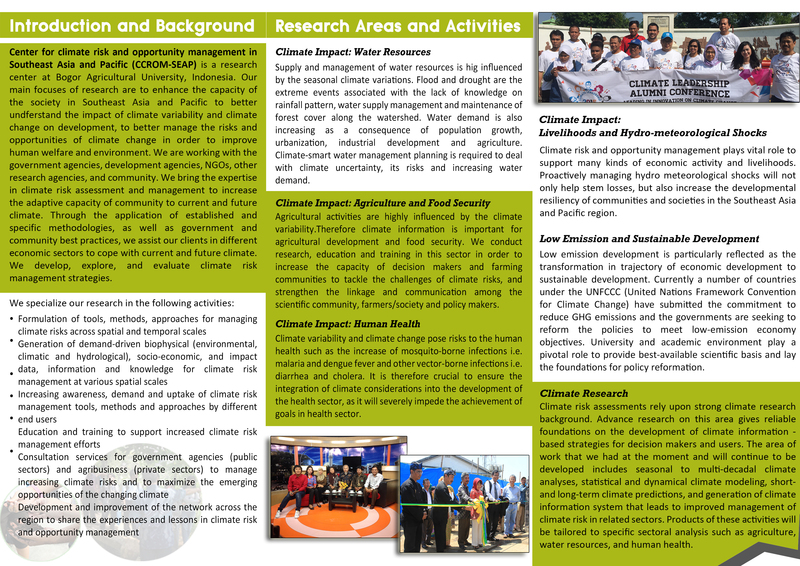 This project is to develop and provide capacity building on climate information and decision support tools to enable poor rural farmers and policy makers better manage the risks associated with climate variability and change. It is anticipated that this project will serve as a mechanism to facilitate south-south collaboration and learning between the three countries. In Indonesia, the project focus areas as currently specified are South Sulawesi (focusing on irrigated rice), South Kalimantan (tidal farming), and NTT (dry land farming). The launched of IFAD Project was held on 5 March 2013 in Santika Hotel Bogor and involved key partners in the development and use of climate services in the agriculture communities that will serve as the project demonstration sites. The main objectives of the meeting was to provide a general project overview, review/discuss agriculture-climate critical risks in the project demonstration sites, and discuss the stakeholder needs for addressing these risks to support project tool design.